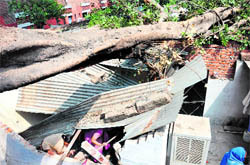 Three-and-a-half-year-old Ahan Dogra had a narrow escape today when the branch of a pipal tree fell on a tin shed in the backyard of a house in Sector 28 here. She had left the spot only a few minutes before the branch collapsed. Strange as it may sound, the Government Multi-Speciality Hospital (GMSH) in Sector 16 deems its Class IV employees, including a safai karamchari, who are matriculates, fit to perform the duty of operating theatre (OT) assistants. Do better govt school results reflect actual performance? Two Chandigarh policemen got a dose of their own Facebook medicine. A web portal set up by the Chandigarh Police on the popular social network site to help maintain law and order with active public cooperation, put two constables in the dock for allegedly violating traffic rules. Their picture showing the pillion rider without a helmet while riding a motorbike has been posted on the portal by a resident. 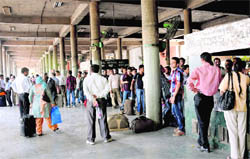 Bus services from the city to various parts of Haryana and Punjab were partially hit today as employees of the Haryana Roadways went on a day-long strike called by the Haryana Roadways Employees Union. By the end of this month, residents in Mohali will be saved from making endless rounds of police stations to procure a copy of a first information report (FIR) or get a no-objection certificate (NOC) before the sale of a vehicle or permission to use loudspeakers for a public function. In a special anti-encroachment drive, the municipal corporation (MC) issued 120 challans in Industrial Area, Phase I, here today for encroaching upon government land. The PGI authorities have slapped a fine of Rs 20,000 each on three chemists running their shops from its premises for overcharging. A report exposing the modus operandi to fleece patients was published in these columns on March 24 following which the PGI authorities had initiated an inquiry. Municipal corporation (MC) Chief Engineer SS Bidda today reviewed advance preventive measures to check water-logging during the ensuing monsoon. Officials of the Haryana Police witnessed the demonstration of an Israel-made unmanned aerial vehicle (UAV) Micro-B at the Sector-5 Parade Ground here yesterday. The health authorities have started a drive to curb the sale of cut fruits, ice, ice candies and other eatables kept in the open here today. The fire and emergency department of the MC has conducted a fire evacuation drill on the request of RBI internal security officer S Balamurugan here today. The decision of the Chandigarh Administration to discontinue the seven-day week for commercial shops in the city has come as a disappointment to most residents. Some traders, however, are happy with the decision. 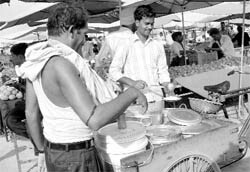 Speaking to Tribune correspondent Akash Ghai, a majority of residents and traders were of the view that shops should remain open on Sunday as it was convenient for working people. The UT education department flagged off an expedition to Manali in Himachal Pradesh at the Sports Complex, Sector 7, here yesterday. The team comprised 90 school students and five teachers. As many as 500 flights were delayed and 79 cancelled in the city over a period of 150 days -- from January to May. With over three flights being delayed every day and cancellations almost every alternate day, the Chandigarh Airport may have acquired the distinction of being one of the most “unpunctual” airports in the country. The Greater Mohali Area Development Authority (GMADA) has been asked to earmark specific locations for holding of apni mandis in new sectors, even as unauthorised sellers have been allowed to operate on payment of user charges at apni mandis to avoid parking problems. Even as the Punjab and Haryana High Court had on October 29 rejected the Haryana government notification upgrading Panchkula as a municipal corporation, the website of the Panchkula district administration continues to mention the municipal council as municipal corporation. Commuters in the district faced harassment in view of the ‘chakka jam’ call given by the Haryana Roadways Employees Union, demanding the cancellation of permits issued by the state government to private transporters. The appointment of Kanwalbir Singh, nephew of Punjab Education Minister Sewa Singh Sekhwan, in PSEB as assistant media and liaison officer against a post that is yet to be created, is in news once again. Electrifying facts about the functioning of Powercom in Zirakpur-for every 444 connections on an average, the corporation has one employee. People belonging to economically weaker sections can now avail financial help under the Shagun Scheme, apart from those belonging to scheduled castes and backward classes, said Varun Roojam, Mohali Deputy Commissioner, here today. Services of two Panjab University (PU) employees were terminated today for beating up another employee under the influence of liquor outside the Aruna Ranjit Chandra hall publicly. An online help centre was set up at the Aruna Chandra Hall near the post office at Panjab University with two terminals to help students fill up online CET and BCom application forms. A 21-day UGC refresher course on ‘Classical and Modern Indian Languages in Global Era’ concluded on the Panjab University campus here today. Witnessing a drop of 16 per cent from last year, only 40 per cent students, who appeared in the Bachelors of Business Administration first year (BBA-I) examination conducted by Panjab University, could clear it this year. The department of higher education is likely to make 50 hours of the social service a mandatory part of education in the city colleges. About 45 participants from different regions, namely Chandigarh, Lucknow, Delhi, Jabalpur, Bangalore, Bhopal, Chennai, Guwahati, Kolkata and Jaipur, are currently attending the 12-day in-service course at Kendriya Vidyalaya (KV), Sector 31, Chandigarh. The course is an aid to upgrade the knowledge. The summer camp that was being held at St Joseph’s Senior Secondary School ended with a gala show today, in which parents also participated. The mother of one of the youths, who were reported to have drowned in Narwana branch near Jansui Head, expressed apprehensions about her son having been done to death or kidnapped by one of his friends. Following the call given by the Haryana Roadways Employees Union, employees of the Haryana Roadways went on a day-long strike here. Panic gripped the town when some passersby noticed breaches in the Bhakra Canal near bridge no 115769 on the Khamano road. Timely action by the authorities and people saved the situation which would have led to great damage to life and property. Various social organisations here staged a protest against the police’s crackdown on Baba Ramdev and his followers in New Delhi recently. Markets in the town remained closed. Haryana DGP Ranjeev Dalal has said the Haryana Police will be completely hi-tech within one year and the working of all police stations will be computerised through the crime and criminal tracking network system. An unidentified pedestrian was hit by a car near the Shani Dev mandir at Phase II, Industrial Area, here yesterday. 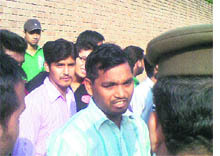 The victim was admitted to the Government Medical College and Hospital, Sector 32, where he was declared brought dead. A 27-year-old cyclist, identified as Papu Kumar, a resident of Pabhat village, hailing from Bihar, died after being hit by an unknown vehicle near the Gurdwara Nabha Sahib on the Zirakpur-Patiala highway today. The incident took place at 10 pm when Papu, who was working as a labourer, was going towards Pabhat village from Chhat side on his bicycle. 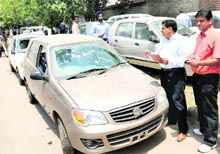 While he reached near the gurdwara, an unknown vehicle hit him from the rear. He fell down on the road and sustained serious injuries. 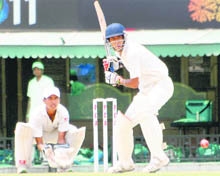 A brilliant unbeaten ton by Navneet Singh helped Amritsar build a defendable total against Mohali on the second day of the four-day Dhruv Pandove Under-19 Cricket Trophy final at the PCA Stadium here today. Kapil Dev XI defeated Harbhajan Singh XI by one run in the Summer Cricket (U-13) League being held at St Stephen’s School, Sector 45, here today. An all-round performance by Sukbhir Singh Chahal helped the Ericsson Club defeat SBWEBX Cricket Club in the first match of the ongoing first T-20 Champions League being held at St Soldier’s School, Sector 28, here today. Chandigarh: The Choikwang Do (CKD) Association will be hosting a two-day national CKD instructor-training programme at the Skating Ring, Sector 10, from June 11 here. Grand Master Instructor Pereira International will be the chief guest on the occasion. A total of 50 CKD instructors from all over India will attend the camp.